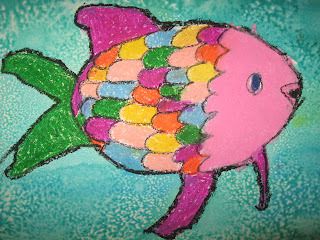 My kindergarteners kicked off our children's book art class with their version of Rainbow Fish. This is a wonderful story about a fish who finds the true meaning of giving when he gives out his beautiful rainbow scales to others, keeping just one for himself. 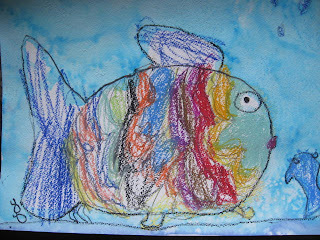 To create their own inspirations my 5 year olds followed a general direction for drawing the fish. I truly love to see the wide range of fish they create just as I tell them there exist in the sea. 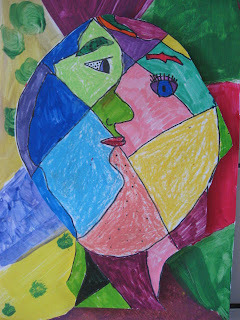 These drawings are finished in oil pastels. 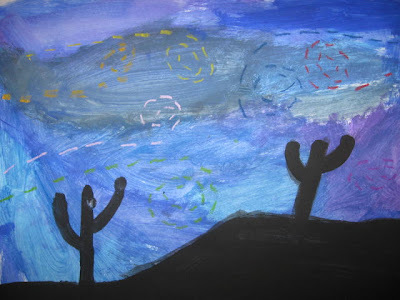 I encourage the children to press hard with their oil pastels as it makes the colors rich and beautiful. They can choose to add sand, sea weed, shells or whatever they would like to create an ocean atmosphere. 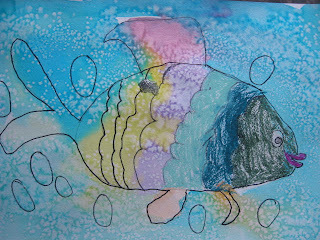 Next they paint a watercolor wash of blues, greens and purples for their ocean. 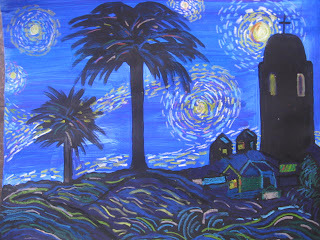 While the paint is wet they sprinkle salt "like fairy dust" across the ocean water. This creates a wonderful stippling effect as the salt absorbs the water. The kids loves this part! 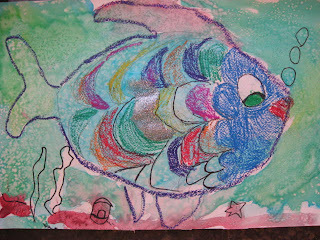 To make these Rainbow Fish complete, the children choose one scale to be glitterized with a squeeze of silver glitter glue. 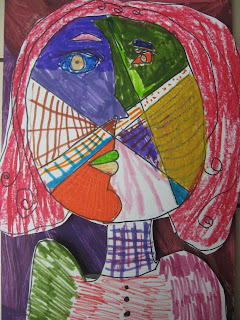 The first 3 fantastic pieces were done by my kindergarteners and the last by my 8 year old, Savannah. 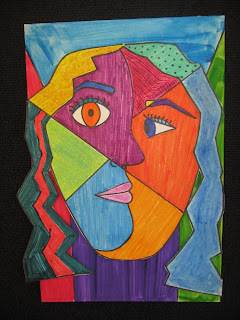 My Mini Modern Artists will be leaving behind the world of Impressionism and jumping in our time machine and speeding ahead about 30 years to focus on one of the most pivotal art movements of the early 20th century, Cubism. 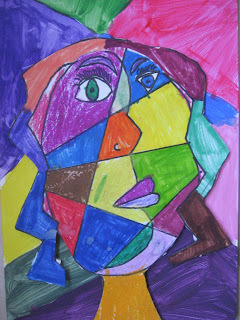 I have done a number of Cubist style art lessons in the past. I wanted to switch things up a bit this time. 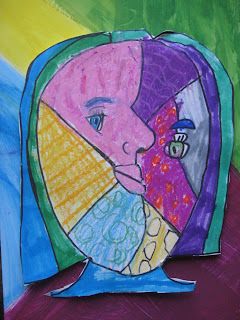 I will review that Cubist artists like Picasso wanted to take apart an object (or face) and put it together in a new way, often showing several angles all at once. 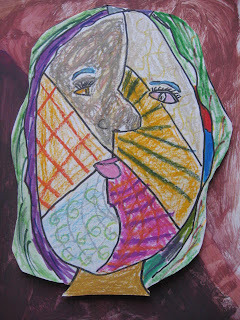 After creating an oval face shape on poster board the children will divide the face with a profile line down the middle. They will create a hard edge, simple hair style. Next they will add features like eyes, mouth and eye brows. 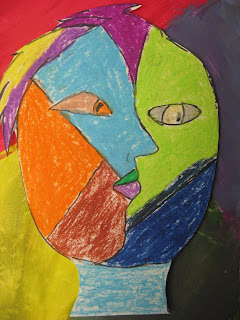 I will review how to create a side view of an eye and mouth. They will be encouraged to put these features on the face in a unique way. 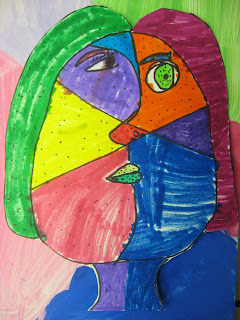 Using a ruler they will divide the face in a couple spots. When they are happy with their design they can go over it in permanent marker. 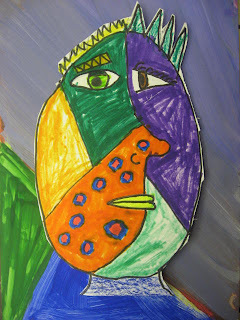 Using markers and oil pastel they will add color, pattern and texture to their shapes. 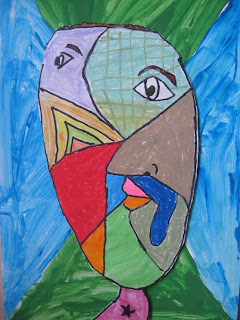 This face is then cut out and glued to a background of foam core that has been painted in a simple graphic way. 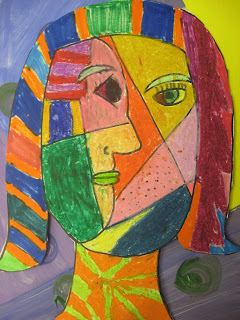 Small pieces of foam core will elevate their face onto their background, creating a 3D effect. 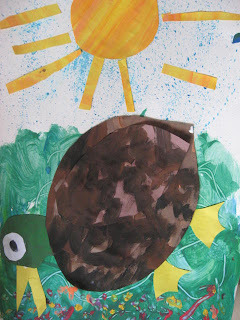 The wonderful book Eric Carle's Animals Animals is full of dozens of his fantastic collage art, from ant to yak. I had a hard time picking one of these animals to choose for my 2 groups of Kindergarteners. I finally decided to do a version of his mallard duck. 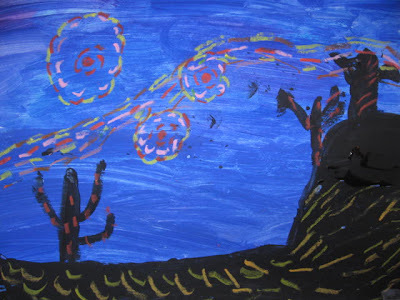 The children will first work on the background by painting the water with wavy lines of blue and green. They will use the end of their brush to make squiggle shapes in the water. To create the colorful food at the bottom of the pond the will make dots of red, orange, yellow and purple. 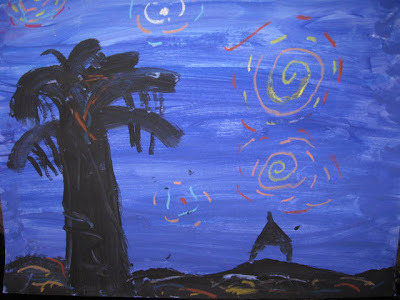 For the last background touch, a splattering of blue watercolor at the top. 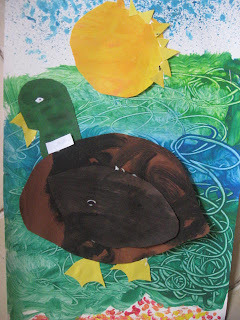 To create the duck, paint brown construction paper with brown, black and orange, again using the back of the paintbrush to create his trademark squiggles. 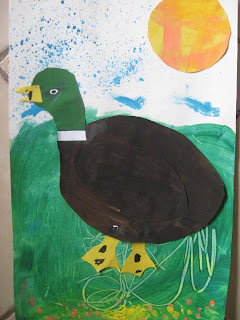 The green head was created by painting a small piece of black construction paper. 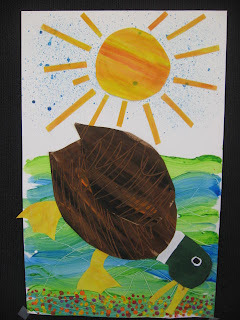 The beak, feet and sun were done by adding smearing streaks in yellow and orange to yellow construction paper. 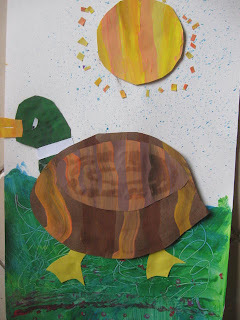 After these papers are dry they will cut out simple shapes on their own or use templates to create the body, wing, head, beak and feet. 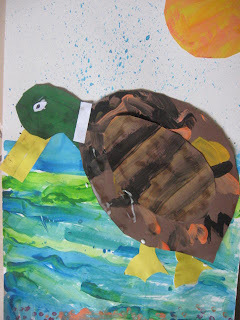 They can decide whether they would like their duck paddling through the water or diving down for some food.